A laugh-out-loud, realistic portrayal of a freshman year in college for fans of Emergency Contact, Broad City, and The Bold Type. Phoebe can't wait to get to college. On her own, discovering new things, no curfew . . . she'll be free. And she'll be totally different: cooler, prettier, smarter . . . the perfect potential girlfriend. Convenient: the only person from her high school also going to York is her longtime crush, Luke. Luke didn't set out to redefine himself, but as soon as he arrives on campus, he finds himself dumping his long-term long-distance girlfriend. And the changes don't stop there. In fact, being on a soccer team is the only thing that stays the same. Just when things start looking up (and Phoebe and Luke start hooking up), drama looms on the horizon. Rumors swirl about the Wall of Shame, a secret text chain run by Luke's soccer team, filled with compromising photos of girls. 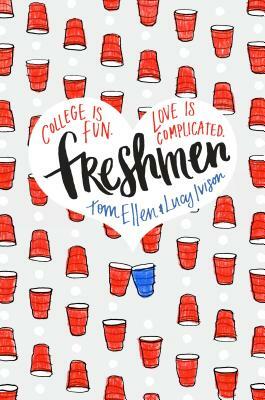 As the women on campus determine to expose the team and shut down the account, Luke and Phoebe find themselves grappling with confusing feelings and wondering how they'll ever make it through freshman year. Tom Ellen and Lucy Ivison met at the end of high school and quickly became sweethearts. Though they broke up in college, they remain best friends. Lucy is a librarian at a girls' school in central London, where she gets most of her inspiration. Tom is a journalist and has written for Time Out, Vice, ESPN, Glamour, and many other publications. Their first book, A Totally Awkward Love Story, was partially inspired by their own high school relationship, with Tom writing Sam's chapters and Lucy writing Hannah's. Freshmen is their second novel together. Follow them on Twitter at @lucyivison.